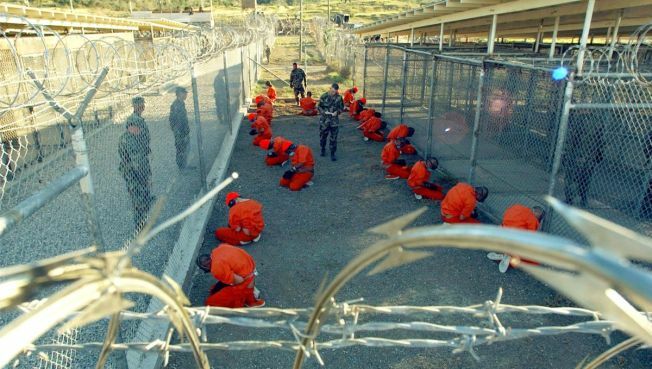 Prisoners at Guantanamo Bay - will anything really change there soon? However, the order also created an interagency commission which will have six months to examine whether to create “additional or different guidance” for non-military agencies such as the CIA. One group that represents detainees, the Center for Constitutional Rights, deemed that an “escape hatch” to potentially allow enhanced interrogations in the future. White House counsel Greg Craig told reporters such fears are misplaced. “This is not an invitation to bring back different techniques than those that are approved inside the Army Field Manual, but an invitation to this task force to make recommendations as to whether or not there should be a separate protocol that's more appropriate to the intelligence community,” he said. The distinction Craig made between “protocols” and “techniques,” though, seems less than clear. “For now, they’re punting, saying they’ll comply with what’s in the Army manual…but at some point in the future this commission may revert to the executive” to recommend harsher techniques, said Kassem, adding that he was concerned about how transparent the commission’s recommendations would be. “I’m happy to postpone that discussion [on “enhanced interrogation”]… on the condition that [it] happens transparently,” he said. 2. Obama ordered a 30-day review of Guantanamo conditions—by the man currently responsible for Guantanamo. A section of Obama’s order on Guantanamo entitled “Humane Standards of Confinement” orders Secretary of Defense Robert Gates to spend the next thirty days reviewing the current conditions at the Caribbean prison to make sure they’re legal and follow the Geneva Convention. It seems doubtful that Gates, who has been atop the chain of command for Guantanamo for more than two years, will suddenly find conditions that were just fine on Monday of this week are now flagrant violations of the Geneva Convention. “He’s not exactly impartial,” Kassem said. 3. Obama vowed no torture on his watch, but force-feeding and solitary confinement apparently continue at Guantanamo for now. It’s possible that the 30-day referral to Gates is simply an effort to buy the Obama team time to deal with two Guantanamo practices that some consider torture, or at least inhumane: force feeding and isolation of prisoners. According to detainee lawyers, about two dozen inmates who refuse to eat as a form of protest are currently being force fed, and about 140 are in some form of solitary confinement. The Bush administration has argued that the feeding is humane and that the solitary, at least as practiced now, is not the kind of total isolation that amounts to torture. “There’s an important distinction to be made between isolation and separation” from other prisoners,” Waxman said. As far as we know, the force feeding and solitary practices continued onto Obama’s watch. Craig dodged a question about the new president’s views on those issues. “I'm not going to get into the details,” Craig said. While Obama ordered a case-by-case review of the 245 prisoners held at Guantanamo, the 600 prisoners held in indefinite American custody in Afghanistan and roughly 20,000 in Iraq won’t get such attention. The general policy review might aid them, eventually, but unless someone was about to torture them it’s unclear how they are better off. “I think there’s a fairly good chance that on the whole from the perspective of my clients at Guantanamo and Bagram [the site of an American air base and prison in Afghanistan], their lives will be the same until those facilities are shut down, unfortunately,” Kassem said. 5. The orders downplay the possibility that some prisoners might be set free in America. Obama ordered that when Guantanamo closes, any remaining inmates “be returned to their home country, released, transferred to a third country, or transferred to another United States detention facility in a manner consistent with law and the national security and foreign policy interests of the United States.” But Obama’s wordsmiths seem to have deliberately trimmed out any explicit mention of the explosive possibility of freeing prisoners on American soil. While Obama’s aides seem to prefer trying prisoners in civil courts or freeing them abroad, there are no obvious charges to be filed against some of the detainees. Once Guantanamo closes, letting them loose in the U.S. may be the only option if other countries won’t take them. One of the attention grabbing provisions of Obama’s orders calls for military tribunals at Guantanamo to be “halted.” But the Obama administration is not ruling out returning to some sort of military forum to deal with some of the prisoners. “This order does not eliminate or extinguish the military commissions, it just stays all proceedings in connection with the ongoing proceedings in Guantanamo,” Craig said, making clear that “improved military commissions” were still on the table.